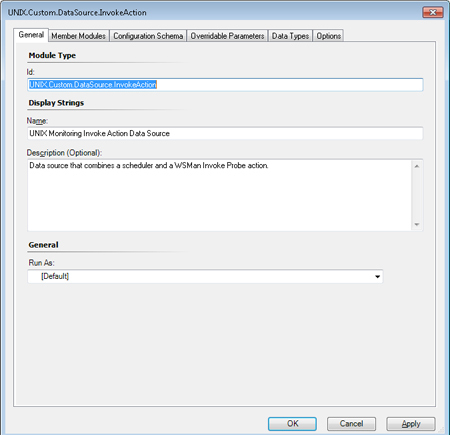 1: Create a new management pack in the authoring console. 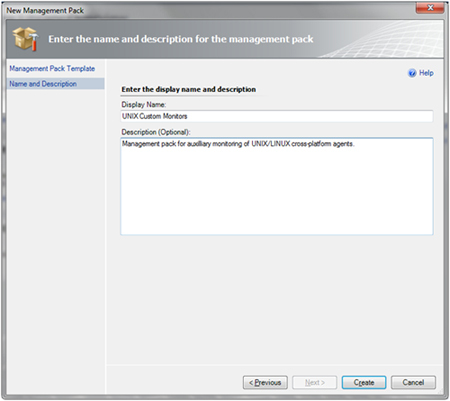 In this case, I am calling the management pack: UNIX Custom Monitors with the id: UNIX.Custom. 2: Add management pack references. In this example, the referenced class and data source are both made available through a reference to the Microsoft.Unix.Library, so it is the only additional reference that I have specified. Additional references could be added to the Microsoft.SystemCenter.DataWarehouse.Library MP if performance data were going to be collected, or specific operating system management packs if those classes were required. 3A: Create the data source. 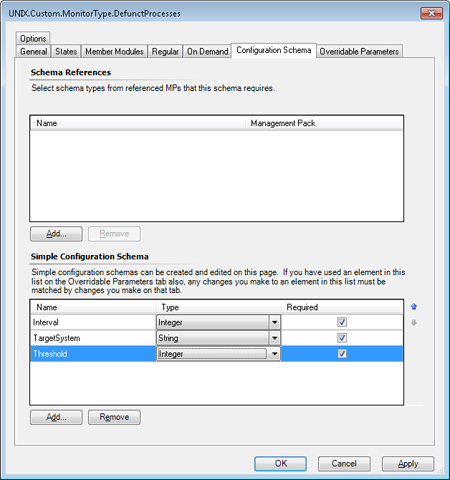 3B: Add data source Configuration Parameters. 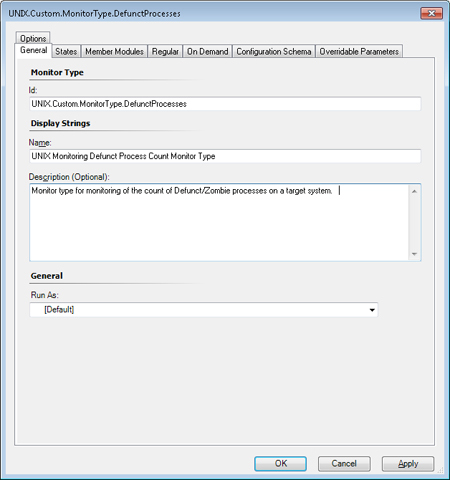 The parameters that will be required for the Scheduler and Invoke probe modules by this data source are. 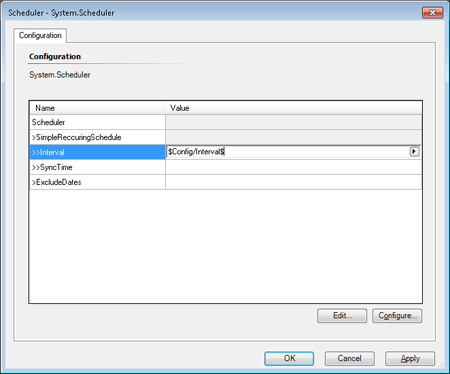 3C: Create the System.Scheduler data source member module, using the Interval configuration parameter to control the interval. 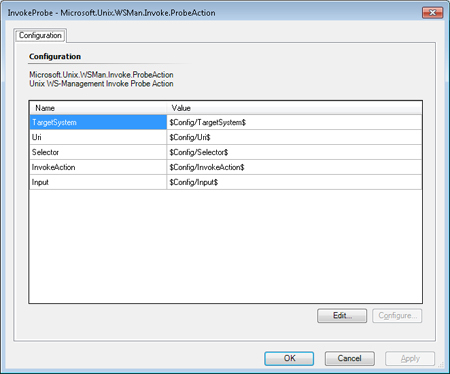 3D: Create the Invoke Probe member module (module type: Microsoft.Unix.WSMan.Invoke.Probe). 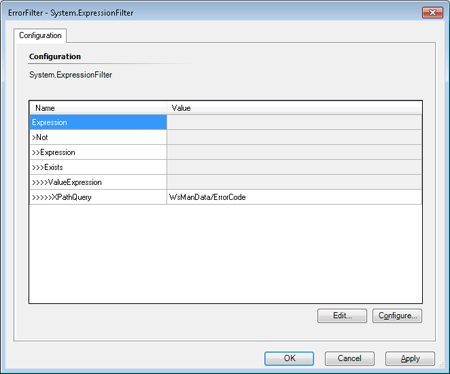 3E: Add an Expression Filter member module to filter errors. 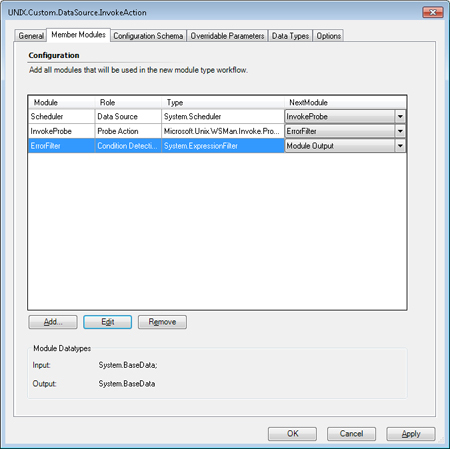 3F: Link the Data Source member modules in order. 4A: Create the Monitor Type (note: there is no need to worry about the runas account in these workflows, as the Microsoft.Unix.WSMan.Invoke.Probe has the standard Cross Platform RunAs accounts already configured. There is an additional module that provides the same funtionality but utilizes the Privileged RunAs profile). 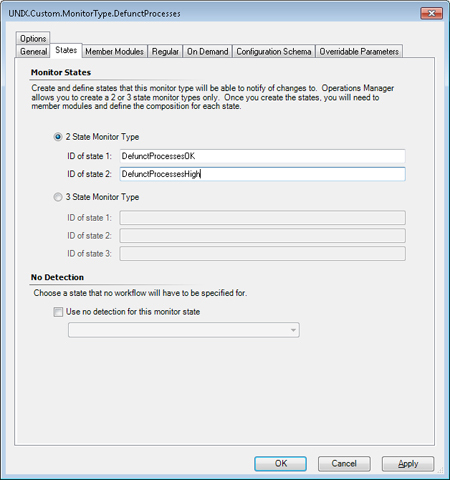 4C: Define the configuration parameters that the monitor will provide to the monitor type (interval, targetsystem, threshold – with interval and threshold defined as overridable). 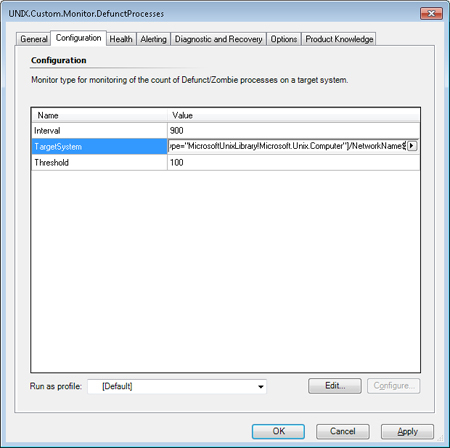 The TargetSystem will be provided from the Network Name property of the monitor target. 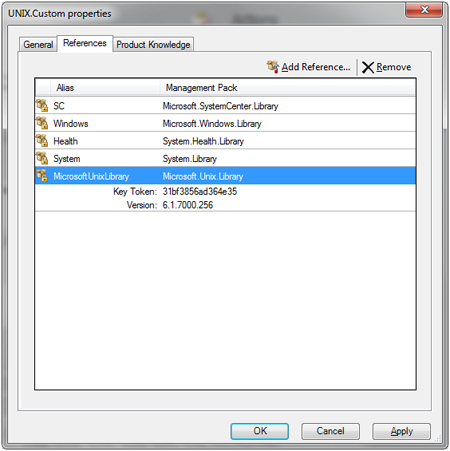 The Uri value is the standard SCX Uri: http://schemas.microsoft.com/wbem/wscim/1/cim-schema/2/SCX_OperatingSystem?__cimnamespace=root/scx. In this case, the Selector is not required. 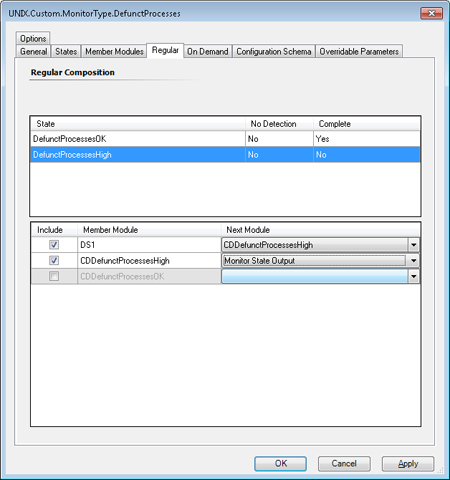 The InvokeAction parameter is: ExecuteShellCommand. 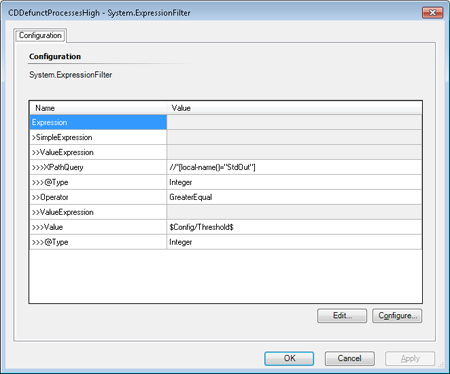 4E: Add the Expression Filter modules for detecting both healthy and unhealthy conditions. As evidenced by this example, the ReturnCode, StdOut, and StdErr from the ExectueShellCommand are all returned in the data item. 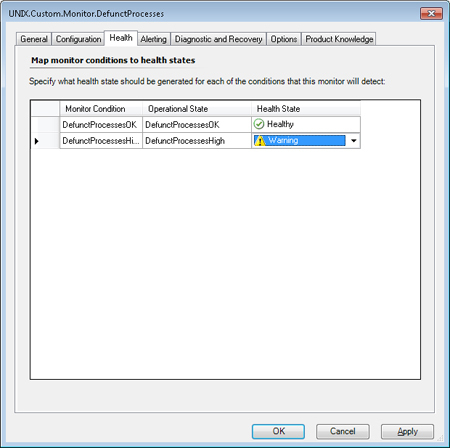 In this case, the monitor will evaluate the StdOut data, which can be accessed with the XPathQuery //*[local-name()=”StdOut”]. 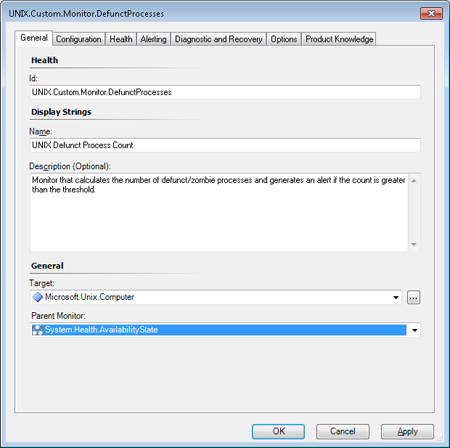 5A: Create the Unit Monitor, targeting the Microsoft UNIX Computer class. 5B: Select the monitor type and set the interval, targetsystem, and threshold parameters. 5C: Set the health state severities. 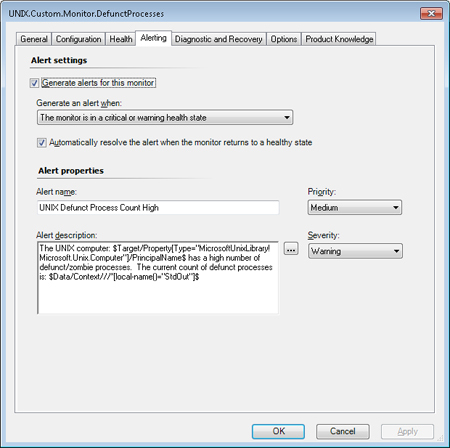 5D: Configure the alert parameters. That’s all it takes to turn a shell command string into a monitor, and the data source can be reused by multiple monitors and rules. 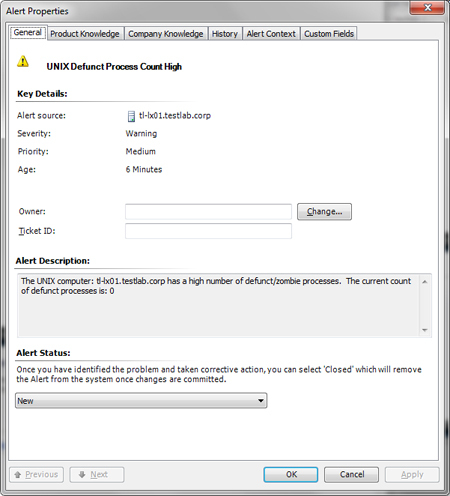 This is a pretty simple example, but the possibilities to use this method for highly customized cross-platform monitoring are substantial. 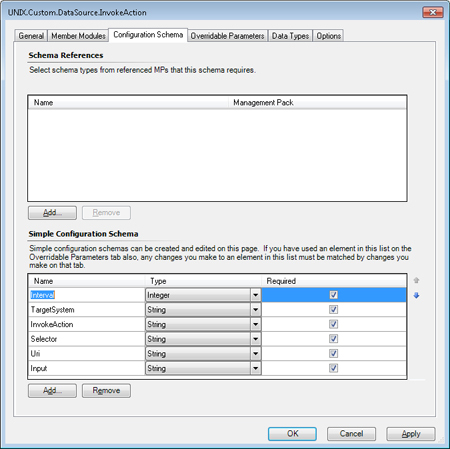 do you have any thoughts how to utilize complex WSMan StdOut output in Scom ? Say, produce 3 perf. counters. I will be posting more on this subject soon, as I am currently working on some SCX management packs relying heavily on processing WSMan StdOut data after it is returned, and I intend to blog about the MP’s. I think the best approach in this case would be to follow your WSMan invoker module with a PowerShell Property Bag probe module. Pass the StdOut data item as a parameter to the PowerShell probe, and then parse the StdOut with the PS script and return it as a property bag. This would allow you to deal with multiple instances of one data item in a discovery scenario (just pipe the StdOut data to a PS foreach-object loop), or handle multiple data values simultaneously (each as a distinct property in the property bag). hmmmm, i forgot about posh modules and tried to accomplish this task using vbs/js modules or even thought about writing our own c# probe module to process wsman output. If you need examples, I can provide some. hey, I have the same question as you asked. I am wondering whether you finally resolve the problem utilizing complex WSMan StdOut output in Scom ? I am really instrested in this issue. Could you share your ideas with me? Thaks a lot! yes, please, it would be great. you should see my email as blog owner. I have attempted to use your guide to create a custom MP for ActiveMQ on a Red Hat Server. The first thing I did was create my script to get the StdOut. I have that script working as such. PERFECT! I figured authoring this with the Authoring Console was going to be easy. No such luck. I added the reference to the Unix.Library and though the reference ID and token match I cannot move on to the next part of the tutorial. ManagementPack not found in the store is the actual message. Your help would be appreciated! I am working on your tutorial as you provided. 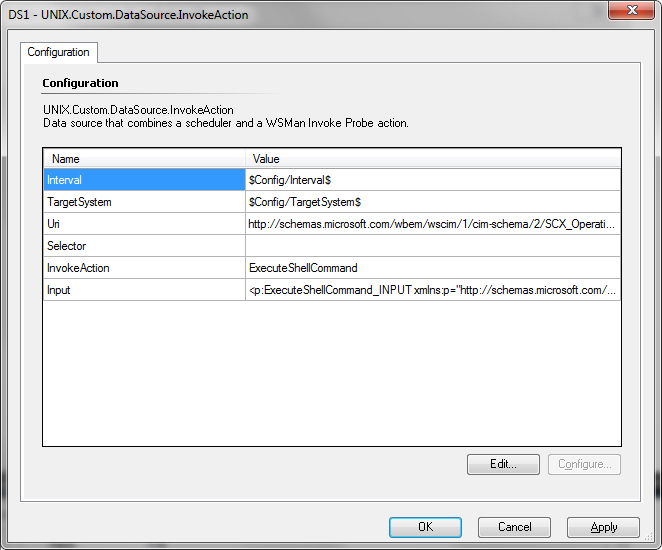 I also need some examples to figure out utilizing complex WSMan StdOut output in Scom.Could you provide some to me? Thanks a lot!